I fell in love—with chocolate chip granola! 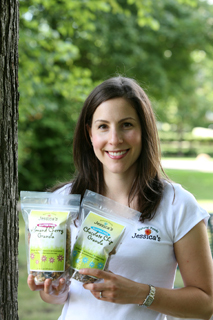 Not just any brand, but Jessica’s Natural Foods granola. I was in Michigan with my wife visiting family and I ran into a Plum Market. Someone, possibly Jessica, was handing out samples of this awesome tasting treat. I thought, no way is this stuff healthy. I then do what I always do in this situation, I read the label. Not bad! The fat wasn’t high and the sugar wasn’t either. It’s also gluten free, so perfect for those who have celiac disease.